The flamethrower, dubbed “Big Friendly Flame,” was created by a 10-member team in the Propulsion Design, Build, Test class this year. Attached to a fire truck called “Heathen,” the project will be center stage at the event, which begins Sunday(August 26). Carson Slabaugh, an AAE assistant professor who taught the course for the first time in the spring, said the directives for the project were simple: “They wanted a really, really big flame,” he said. The 10-member team that developed, tested and assembled the large, artistic flame device delivered the flame thrower project in July to Walter Productions, the company that sponsored the project. Some members of the Purdue student team headed out to Burning Man in the Black Rock Desert in Nevada this week to help to get the project integrated. For video of the project, go to https://youtu.be/UUZNLjhHwMI. The project was not as simple as creating a big flame. There were restrictions. For one, the team would not be allowed to use liquid fuel, Slabaugh said. With that in mind, the group opted for the gaseous fuel propane. But that brought other challenges. Philip Piper, the team leader on the project and a graduate research assistant, said Maurice J. Zucrow Laboratories, the nation’s largest university propulsion lab, was used to develop and build a prototype of the concept. “(Zucrow is) amazing because they really have all the expertise, all the components, all the facilities that were needed,” he said. The system that ultimately was created has three combustion devices: A pilot system that stays lit at all times; a torch ignitor and an ejector. The team also built an “accumulator,” or a tanking system, to transfer liquid propane into it and eject the propane as liquid. It flashes to vapor quickly. But using an accumulator system as well as ejecting the liquid allowed the team to bring the pressure to about 500 PSI. A typical propane tank has pressure about 100-150 PSI. 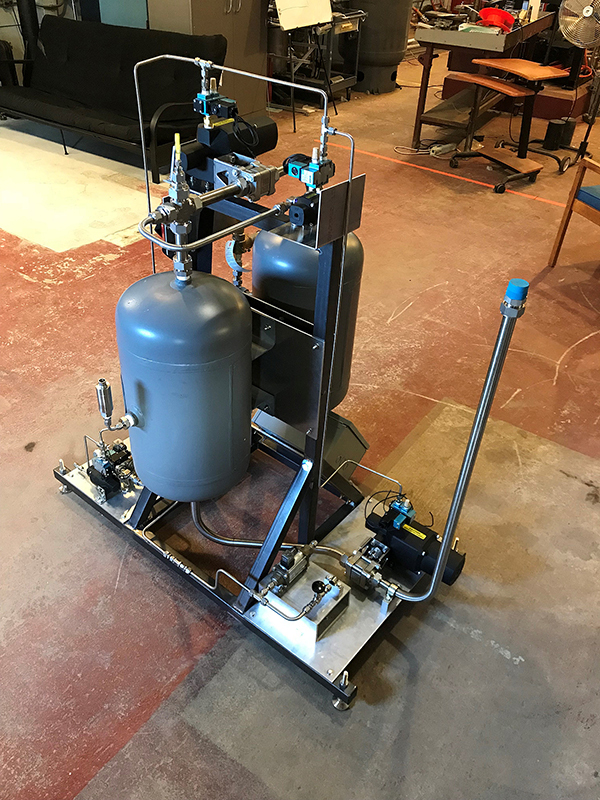 “We created a nitrogen pressurization system that let us not only eject the propane in a liquid phase but also push it up to much higher pressures,” Slabaugh said. A liquid propane test with 480 PSI and 16.4 pounds of mass flow produced a 103-foot flame height – as well as a vortex ring and massive, lingering smoke ring. Ultimately, Slabaugh said the team reached nearly 130 feet high in testing. It’s not the first time the course has designed projects to be displayed at Burning Man. In 2015, a student group designed a “pulse jet,” twin valveless pulse jet engines that attached to Walter’s “Mona Lisa.” In 2014, another student team designed “Helios,” music-controlled propane torches that initially were attached to Walter’s three-story mobile dance party machine. In 2013, a team of students created a “combustible vortex ring generator” to be mounted onto Heathen. That device was featured in a piece on “Discovery Channel.” Those classes all were led by Timothée Pourpoint, an associate professor in AAE. Piper was joined on the project by Rohan Gejji, a post-doctoral research associate in Slabaugh’s research group, as project mentor, as well as AAE students Hasan Celebi, Blair Francis, Tristan Hagerman, Mark Hurt, Naveen Joel, Steven Pugia, Angel Rodriguez and Brandon Smail.